Armagh claimed the Ulster Football title after coming good in the second half to beat Fermanagh in Sunday's final replay at Clones. Fermanagh will rue nine first-half wides which meant that the teams went in at 0-4 each even though the Ernemen had dominated most of the proceedings. 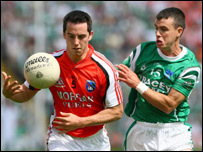 The suspicion that Fermanagh would pay for the misses became a reality as Armagh moved into a 0-10 to 0-6 lead. Steven McDonnell's late goal from a rebound sealed Armagh's victory. In truth, Fermanagh already looked beaten by the time McDonnell rattled in his 68th-minute goal after Ronan Clarke's pointblank shot had come back off the woodwork. The result leaves Fermanagh still looking for the county's first ever Ulster Senior title and it's a defeat that will really hurt the squad. Half-decent shooting in the opening period would have ensured a lead of at least four or five points as the Ernemen's running game caused problems for a ponderous looking Armagh outfit. Both Fermanagh and Armagh made late changes to their line-ups with Matthew Keenan introduced for Fermanagh in place of James Sherry and Tony Kernan replacing his brother Stephen. The gamble of starting Keenan for his free-taking backfired badly as he missed two straightforward chances early on and with his confidence shot, Tom Brewster replaced him in the 26th minute. The sides swapped points in the early stages but Fermanagh had already struck four wides by the 10th minute. Steven McDonnell had the ball in the Fermanagh net in the 14th minute but the effort was correctly ruled out for a square ball infringement by Ronan Clarke. After being 0-2 apiece after 10 minutes, the match failed to produce a score for 22 minutes - largely because of dreadful Fermanagh shooting. The Keenans Ryan and Matthew were guilty on a number of occasions while there were other culprits including Liam McBarron and Eamon Maguire. Tony Kernan ended the scoring drought in the 32nd minute and there were three more scores before the break as the sides went in level. Tony Kernan nudged Armagh ahead two minutes after the break but Barry Owens, introduced for McBarron shortly after the interval, set up Damien Kelly to level. However, Armagh looked a lot sharper after the break and Brian Mallon dispossessed Peter Sherry to score and Ronan Clarke then notched another great Orchard County score. Fermanagh then suffered a hammer blow when Owens had to be stretchered off because of a knee injury less than 10 minutes after his introduction. Tom Brewster swung over a great score to give Fermanagh renewed hope but Martin McGrath missed a chance to equalise and then compounded his error by immediately conceding a free which Aaron Kernan pointed. McDonnell had been well held during most of the contest but he then hit two quick points to increase Armagh's lead to four. Fermanagh were still getting plenty of possession but it never looked as though their attack was going to have the potency to mount a late comeback. Armagh were leading 0-11 to 0-7 when McDonnell rammed home the clinching goal from close range. 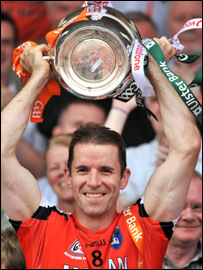 The victory represented Armagh's seventh Ulster title in their last 10 attempts but they will need to play better in the coming weeks in order to add to their solitary Sam Maguire triumph in 2002. Armagh: P Hearty, A Mallon, F Bellew, F Moriarty, A Kernan (0-4), A O'Rourke, C McKeever, P McGrane, K Toner, C Vernon, B Mallon (0-1), M O'Rourke, S McDonnell (1-2), R Clarke (0-2), T Kernan (0-2). Subs: P Kernan for A Mallon 45 mins, S Kernan for T Kernan 61, P Duffy for Vernon 63, B Donaghy for Bellew 69. Fermanagh: R Gallagher, S Goan, S McDermott, P Sherry, D Kelly (0-1), R McCluskey, T McElroy, M McGrath, M Murphy, C McElroy, M Keenan, R Keenan (0-1), E Maguire (0-2), L McBarron, M Little (0-1). Subs: T Brewster (0-2) for M Keenan 26, B Owens for McBarron 38, S McCabe (0-1) for C McElroy 43, J Sherry for Owens 48, S Doherty for R Keenan 64.